In the particular case of Héctor Zamora, the reflection on architecturaland urban development processes has been expressed through the use oftwo basic construction materials: the tile and the brick. 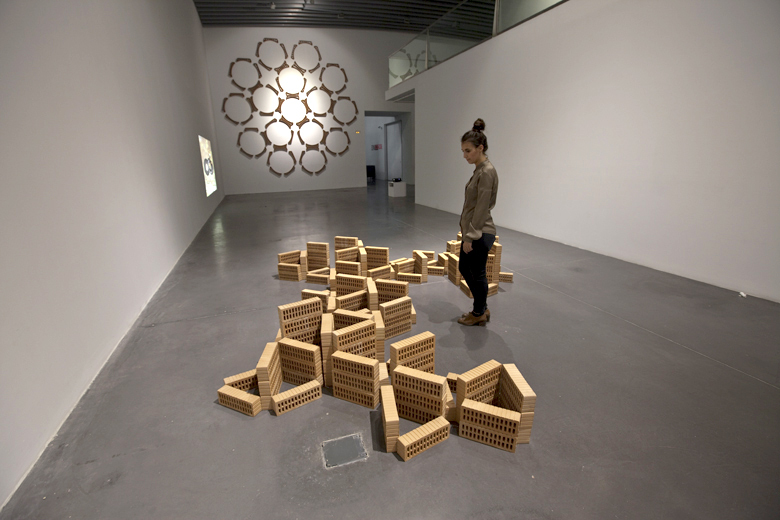 Plan (2009) featuresalmost one hundred roof tiles arranged in a circle on the ground. As ifit were a Constructivist artefact, the piece displays for the spectator thefaktura of the tile, that is, its specific proper ties (clay composition, reddishcolour, concave shape), as well as its tektonika or physical presence in agiven space. As it is known, the legacy of Suprematism and Constructivism’” and, by extension, of the De Stijl and the Bauhaus ‘” was adopted inLatin America in the form of several abstract geometrisms starting in the1930s and 40s.20 Zamora himself, who lives and works in São Paulo, hasstated that Concretism and Neoconcretism have influenced his work.The piece Plan clearly shows this influence of the old and new avantgardes,whose interest in the geometrical form was always framed within a broaderagenda that aspired to transform everyday life with affordable and widelyavailable production materials ‘” and through the application of theiremerging aesthetic language to all artistic and industrial disciplines.But Zamora is aware that this geometrical tradition has been subject torevisions and critiques, and rather than paying homage to it, he haschosen to expand it with new plastic investigations. 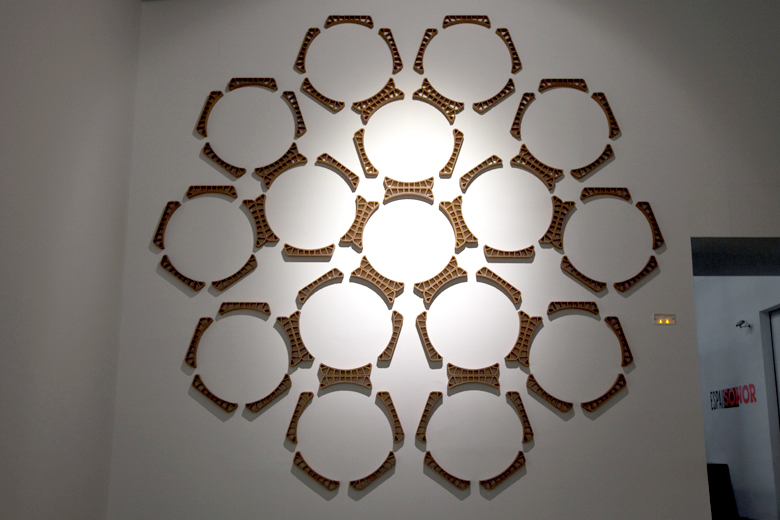 For instance, whenfacing a piece such as 6 de la serie de potencialidades (2009), it is hardnot to think of the philosophical proposals of deconstruction as they havebeen expressed in art, architecture and graphic design in these past fewyears. 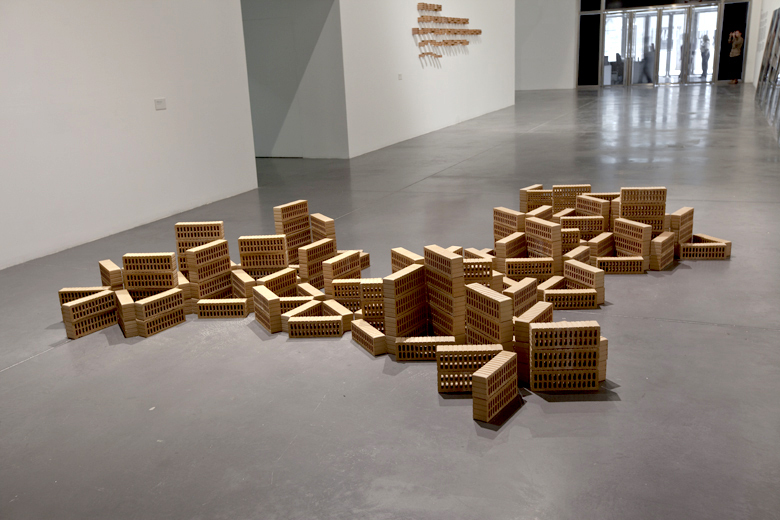 In this work Zamora takes the brick, the quintessential constructionelement, and decomposes it into 63 small par ts. In deconstructing this’basic unit’ into numerous particles he not only shows the inter naland divisive structure of the brick, but also suggests its potential to berearranged. 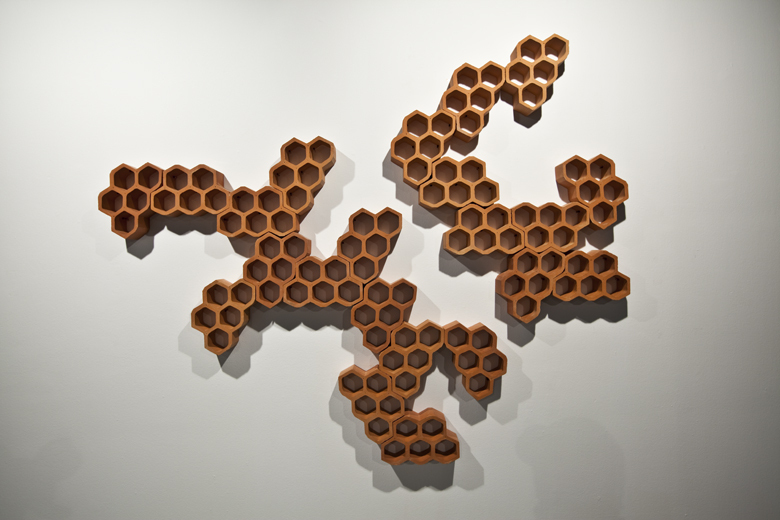 The brick is turned into a structure that must be examinedfrom within and where several interrelated modules coexist. Just asdeconstruction argues that the meaning of a text is always confor medby several opposing meanings that struggle to impose themselves anddominate the others,Zamora, by arranging the various pieces ver ticallyon the wall, proves that the brick is not an indivisible and ‘natural’ unity,but a construction susceptible of being examined and rearranged as theartist wishes. 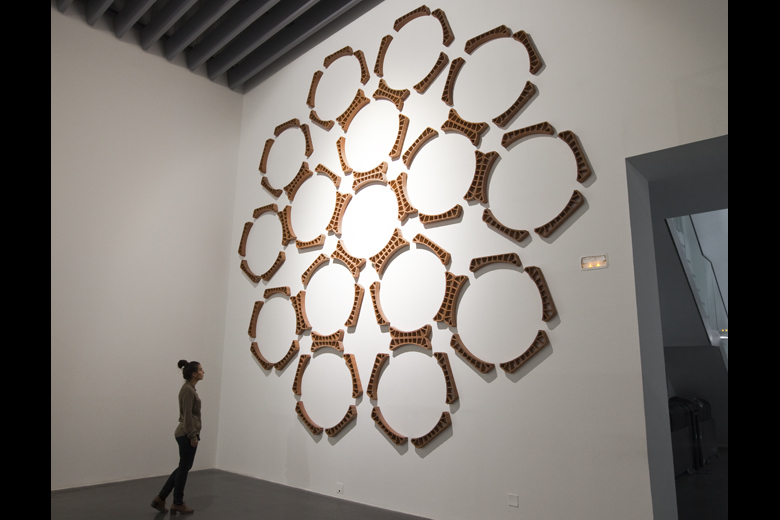 The works Zuncho, Escalón and Botellero, all from 2012, offer variationson the same theme. 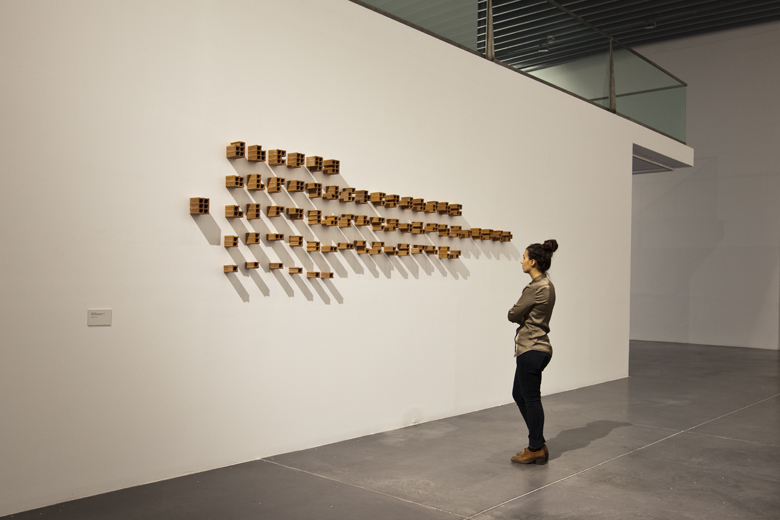 Starting from a specific typology of industrial material(the titles of the works derive from the name with which these typologiesare labelled in building supply brochures), Zamora generates a specificrhythmic arrangement and gives this earthenware piece a functiondifferent from the one it was originally designed for. 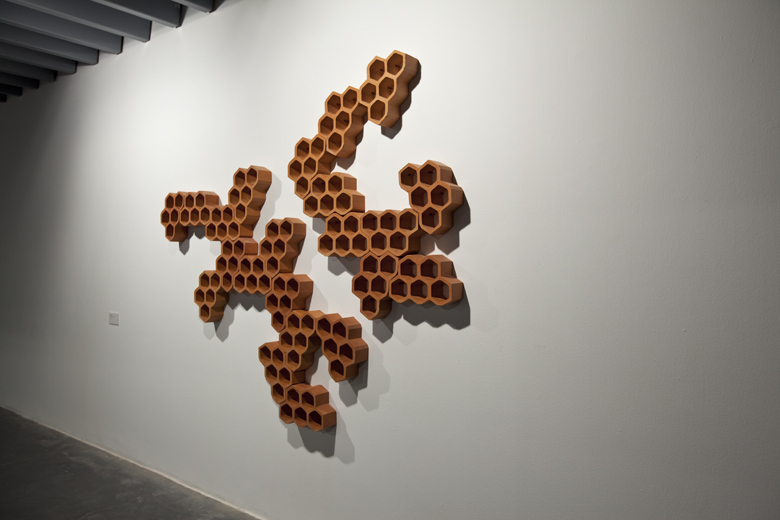 Thus, the functionof the brick and the tile changes radically: these materials becomeelements of artistic creation rather than units of architectural construction.Rearranged into new compositions (like the musicians at the end ofCruzada), the pieces are installed on the walls, suspended in the air,to produce forms that look like signs of a coded language or like notesflowing animatedly on a sheet of experimental music.The primordial construction material, now arranged geometrically,deconstructed or reorganised, helps Zamora establish a new relationshipbetween the phenomena of chaos and control. 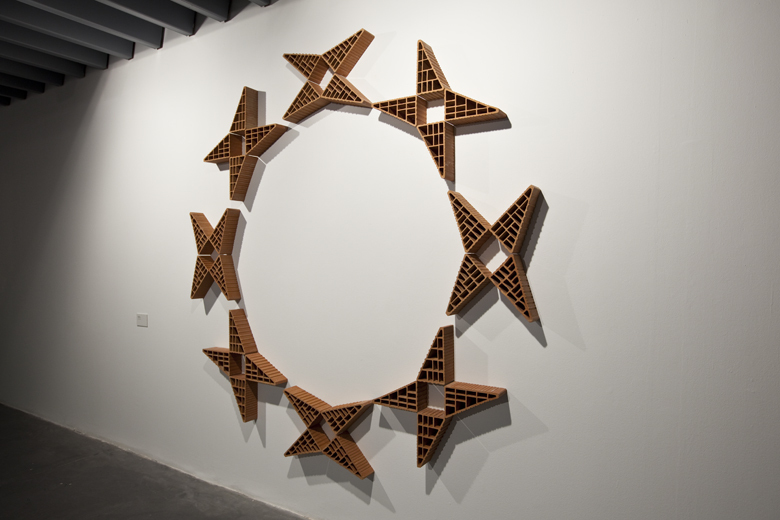 The ar tist startedexperimenting with roof tiles and bricks in 2009 when he was working ina studio in São Paulo from which he could obser ve the daily progressivereconfiguration of a neighbourhood that used to be a favela. Like Apóstol,Zamora was interested in the process of the unregulated and chaoticdevelopment and arrangement of the urban fabric. 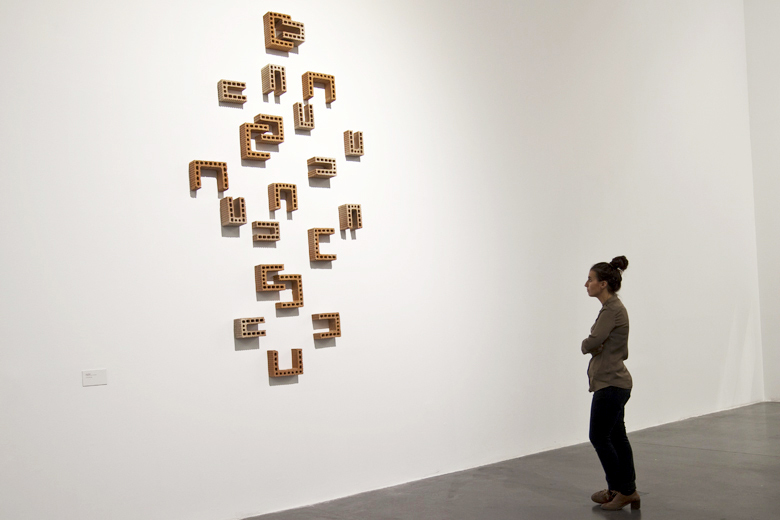 This process, in fact,was the inspiration for his work Swiss Modul Tropicalizado presented inBasel in 2010. 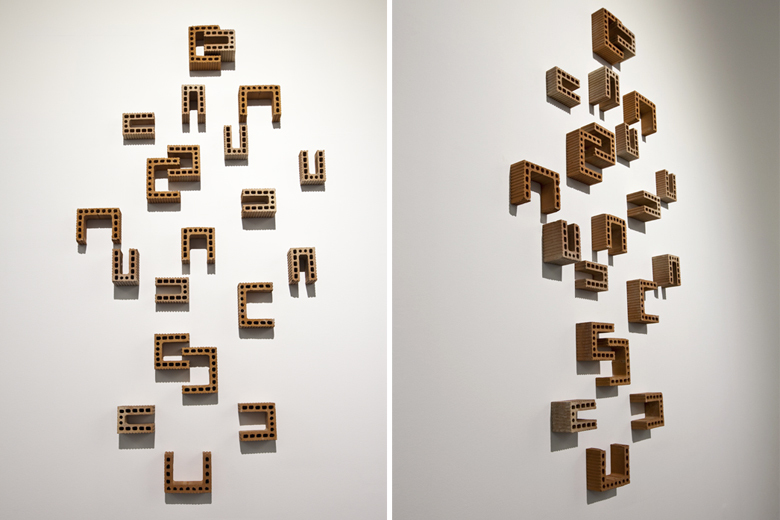 Built with around 220 Swiss bricks, commercially producedunder the name Swiss Modul, the sculpture recreates an imaginar y citywhere the expansion of ‘buildings’ of different height and length is theresult of chance and random choices. 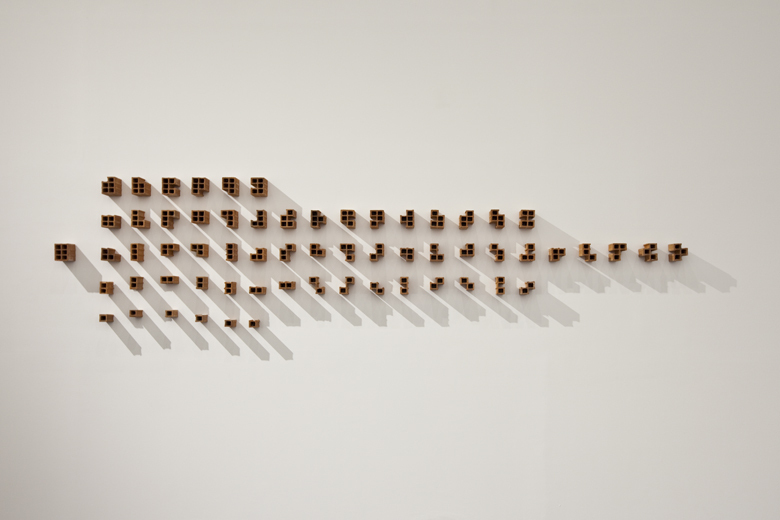 The piece, in the words of the ar tist,is a ‘tropicalisation’23 of Swiss order; it subjects the ‘controlled’ structureto a process of improvisation that creates a tension in its compositionalform ‘” thus reflecting on the imprecise and disordered way in whichmegacities grow nowadays on a global scale.Revoltón, also produced this year, puts into play the organic expansion ofthe red piece of clay ‘” which Zamora now conceives as a material with’extraordinary flexibility’24 ‘” and uses it to explore the by now fuzzyboundary between grid and curvature, rigidity and modulation, controland randomness. 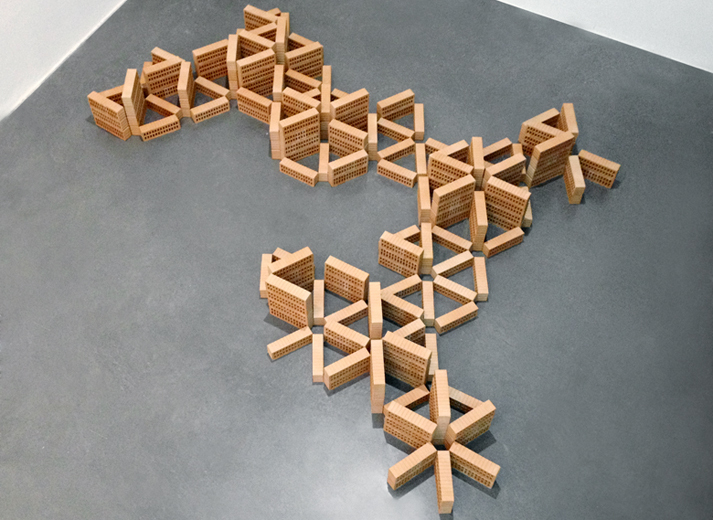 Zamora had already worked with versatile and organicmaterials to generate spatial tension in three other installations. 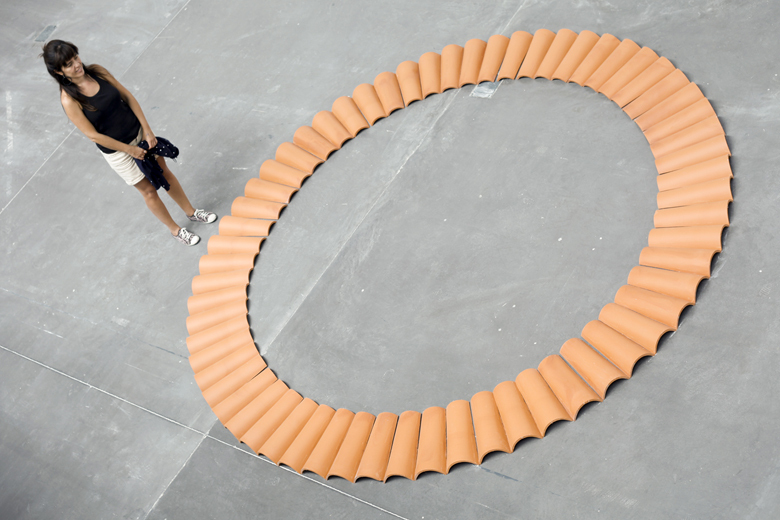 One ofhis first interventions, Pneu (2003), created for Galería Garash in MexicoCity, was an enormous inflatable red plastic tube, 130 metres long and 2metres in diameter, which occupied the indoor space of the galler y andoverflowed the exhibition room when inflated, as if it were an organismgrowing out from the insides of the building.In his installation Enjambre de dirigibles (2009), created forthe 53rd Venice Biennale, Zamora stuck agigantic dirigible in a narrow street of the Arsenale, giving the spectatorsthe sensation that the dirigible was about to explode. And in Deliriosatópicos (2009), he filled two apartments in office buildings in the centreof Bogotá with bananas to the point that these were pushing out of thewindows of both spaces, once again promoting a high tension betweenarchitecture and nature. ‘The energy of the natural, of the organic, thatneeds to push out and grow, literally violates the inner space,’ the artistnoted once. ‘It escapes and comes out onto the street in order to activatethe public space”. In the installation N S E O NE NO SE SO (2009), Zamora once againuses inflatable material. In this case it is eight orange plastic sleeves, suchas those found in roads and airpor ts to show the direction of the wind.Each windsock marks a different direction (north, south, east, west’¦)creating an impossible situation: the wind blowing in ever y directionat once. The subtitle of the installation ‘” ‘Veiled, sinuous and abusiveexercise of power’ ‘” reasserts that this is neither a joke nor a mereformalistic exercise. The physical tension of this ar t work makes explicitthe antidemocratic exertions of power that manipulate people with falsejustifications: ‘That is what politicians, banks, oil companies or foodmanufacturers are doing,’ Zamora has remarked. ‘They play with us andpoint in the direction we must follow, even though they are just lies orerrors that benefit the interests of a chosen few ‘.